Classic arcade series Bomberman explodes onto PS4 with exclusive new characters. The legendary Bomberman series makes the jump to PS4, with iconic PlayStation characters Ratchet & Clank along for the ride. Team-up with a friend or go solo and prepare to save a whole new galaxy as you face down the Evil Emperor Buggler. Play as Solana’s two pluckiest heroes, Ratchet & Clank, one of the eight original Bomberman brothers or a host of new legendary heroes such as Symphony of the Night’s Dracula or Silent Hill’s Pyramid Head. Super Bomberman R brings the series’ classic arcade play, including co-op, team, and solo battles to PS4 with both offline and online game modes. Tackle the story-driven campaign mode either by yourself or with a friend in local co-op. Team-up with the eight legendary Bomberman brothers and help them defeat the Evil Emperor Buggler! Test your ballistic abilities in the classic multiplayer Battle Mode, facing off against either three friends locally or go online for an explosive eight-player showdown! Put your team-work to the test in the new competitive ‘Grand Prix’ mode. Here, up to 6 players online will fight it out to demonstrate their incredible bombing skills and be crowned the ultimate victor. 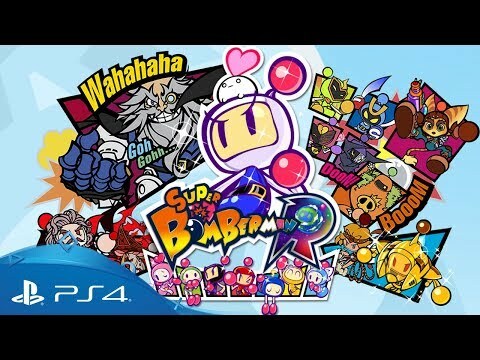 Buy Super Bomberman R on PS4. PlayStation Plus members, pre-order now and receive a special discount! Want more fun party games?